Weather here still good, we had a windy yesterday but it's more quiet now. Personally I've hit a little snag - seems like my body somehow didn't appreciate me going from dark & cold Netherlands to sunny & warm Jamaica. I've developed a mild form of sun allergy. Like having a cold during my first few days here wasn't ironic enough... Aaah well, I'm lucky in that it doesn't itch, and as long as I'm a bit careful with sun it's ok. And to be honest, I'd much rather be intolerant to sun than to food, I've never been the sunloving type anyway. Talking about food, Mrs. Whyte from Sweet Spice deserves a medal. She is apparently the one who provides us with the lunch, and again it was very good. 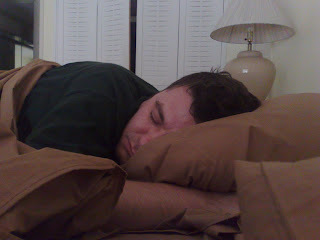 I've had a little sleepy-sleepy on the couch, Till is still going on and on about coding. How can he have so much to say about just some plain textfiles which happen to be compilable to applications? His voice was soothing enough to help me sleep, so whatevah. Yesterday was great. 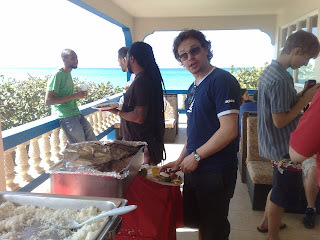 Talks, browsing, swimming in the see, eating Jerk Chicken and drinking rum. Jerk chicken is a local food which came highly recommended by all three Jamaican guys I know here, so it had to be good. I did make the mistake of ordering it at the hotel restaurant, which resulted in a fierce discussion between the waitress and Dmitri, who considered Jerk chicken only any good if you can actually see and smell the smoke. Yeah, it's smoked in a large oil drum with lots of smoke coming out. Anyway, so I had a chance of making up for that mistake when Dmitri told me there was actual good Jerk chicken just around the corner. We passed it on the way back to the hotel with our drinks, and I convinced Adriaan to have some with me. Us stopping there resulted in the whole group stopping there and simply following us in line to grab some Jerk chicken. I really doubt anyone felt sorry about that. That stuff was really good. 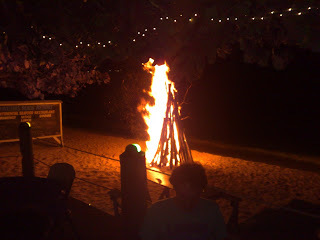 After we arrived back at the hotel a big group went to the beach, sitting on the bench just before the water, drinking rum, having a nightly swim. Imagine floating in the warm sea, looking at the stars above you. 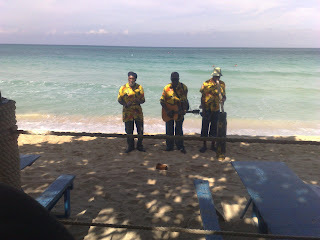 Jamaica rocks. Work? Yeah, trying to get some work done, but I am not as productive as I'd like to. I do have a first article coming which covers the first 2 days. Hopefully that'll go online tomorrow. And I have spend some time on the release announcement and feature guide as well. 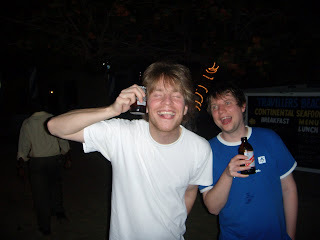 BTW2 My previous blog featured a foto from me and a German. 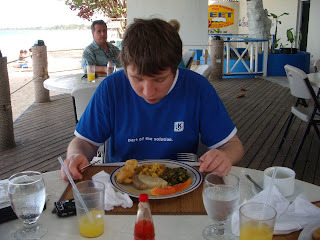 In a (weak) effort to ruin his day - we're talking Holger Schroder, KDE-on-Windows hacker here. Sorry, inside joke. Working on the articles there were a few things I didn't put in there. 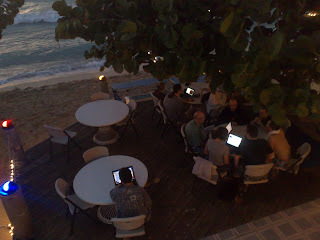 Last night I'm sure the Plasma team had their weirdest location for discussing code - ever. 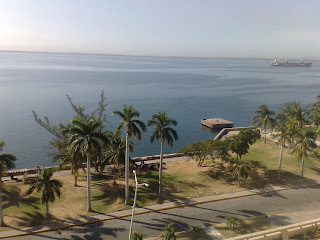 The Caribean sea. Now I'm all for technical talk but that went a bit too far for me, Others however, on hearing there was a discussion about plasma going on, joined them. Aaah well. I've been drinking Jamaican Rum and beer, pretty good stuff. The morning here was interesting, as many ppl had arrived late last night. I just heard Zack appologize for being Zack ("I'm sorry, I'm Zack"), there is a guy sitting next to me with a "One Laptop Velicoraptor per child" t-shirt and I'm sure there have never been so many laptops on this beach. The food is very good. I had a Jamaican breakfeast yesterday just like today, loved it despite having no idea what I was eating. It turned out most of it grew on trees. Interesting. So everytime I saw a blank stare at a plate I just told'em to stop worrying and eat it. Yeah, about that company. I'm amazed by Jamaican hospitality. For me, dutch, being rather crude & simple folks, it makes me feel uncomfortable. My host gave me his bed, and made me breakfeast. Even cut the fruit in pieces - last person who did that whas my mom, and that was a long time ago. Hmmm. When I have a friend over, I trow a matress on the floor and tell him where the kitchen is... How's that for a different culture?!? During all the travelling I did I thought about the news from Nokia. Most of the readers probably know what I’m talking about. Nokia just made clear how committed they are to KDE and Qt, and to open development. The impact of this could potentially be huge. On one hand, I doubt many current customers will stop paying Qt Software for their product, despite the fact they can use it for free. Many of them will probably be glad to not have to manage licenses anymore but they will continue to pay for support. Of course this is the last push for those who didn’t want to use Qt “because it was not free” (and for who GPL wasn’t good enough?!?). Now there are no more excuses not to use the best technology available. Personally I was completely fine with the GPL license – no free development of proprietary software, contribute either code or money. Well, with Nokia’s resources Qt development doesn’t fully depend on that income anymore, so I guess it’s not a big issue. For KDE this might be nice as well – “Qt Everywhere” is of course good for us, more potential users of our development framework and more people who know of our technology. But imho the closer cooperation Nokia would like to see between the KDE community and Qt Software is potentially much more important than the new license. The license, as far as I’m concerned, is a message of welcoming cooperation to the community. We’d love to see development open up, naturally. There are patches circling around in the KDE community, and more importantly, ideas and creativity. I’m sure there are people who would love to take a stab at certain Qt code. And there might very well be commercial clients of Qt who are interested in such a thing as well. 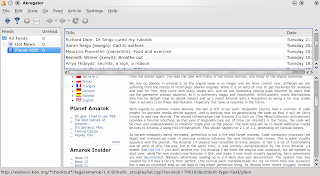 This brings them in contact with KDE – we can use input from commercial parties. We’d love to know their needs and requirements, and collaborate with them on making the Qt platform even better. 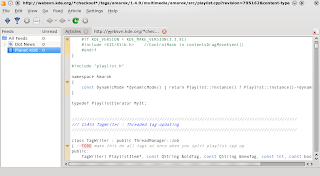 In time, closer collaboration between Qt and KDE could result in a more smooth ride for code from the KDE libraries into Qt libraries – until now, that has always been difficult. Exciting times. 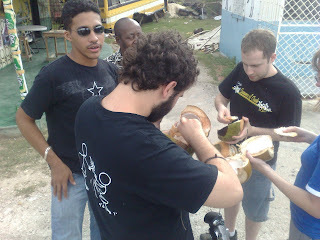 Not just for us in Jamaica or the KDE community around the world, but for the whole Free Software World at large. I believe without superior technology like Qt the Free Desktop doesn’t stand much of a chance. Being free, no matter how important to many, is not a very strong argument for everybody, and the KDE and Qt technology offers us a chance of simply being better than the competition. I'll be going from Kingston to Negril today, by bus - sun, sightseeing and again good company as Roger will be going with me. Happy new year to all of ya! Check the commit digest from the 23th and look at the statistics. First of all, over 900 bugs fixed. 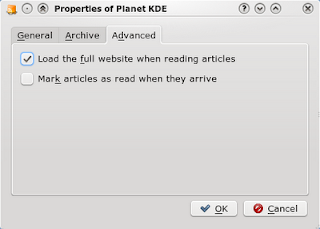 Good news for the stability of the KDE 42 release. And second, over 270 programmers added their code to the repository that week. I'm not such a SVN-statistics-expert like that weird brittish guy, but I believe we have a record. Not in terms of lines of code, we often cross the 9500-lines-modified-per-week mark, but looking back a few digests I never saw more than 260 people commit in one week. As Paul's green blobs show, not everybody commits each week and this high number could be a coincidence. I think it's not. As Tom Albers already noted, we've giving out SVN accounts like they're cookies. Delicious cookies for which you only had to proove you can write decent code & be a decent person. 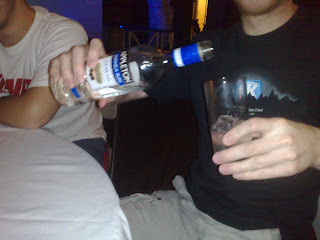 To all of you: a toast on the future of KDE, and the wish that we all may be able to continue to express our creativity and promote freedom for years to come!